Granite gives homeowners in the Southwest area the ability to harness the beauty and power of nature. From our inception to today, the Eleganzza Granite Inc. team has been providing the Southwest area with excellent countertop, shutter, and remodeling services. Although we started as a granite supplier and countertop contractor, we’ve since expanded to provide all types of wood and stone to homeowners in El Paso and the surrounding areas. Our expertise and experience in the field makes us the go-to choice for anyone who is looking to add a touch of natural beauty to their home. We work with all types of stone, from granite and quartz to marble and onyx. This allows us to provide our clients with complete, unbridled freedom of selection. Being based in the city of El Paso allows us to supply granite and other stone materials to the Southwest area. We work with homeowners, home builders, and contractors to bring granite creations to life. Although granite is natural stone cut from the earth itself, our team has the expertise to use this natural material to create one-of-a-kind sinks, countertops, shelves, and much more. 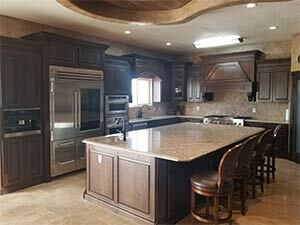 Specializing in kitchens and bathrooms allows us to focus on providing the best possible service. It is our goal to bring about the kitchen or bathrooms our clients dream of. We won’t stop short of perfection. If you’re looking to remodel your kitchen or bathroom, we can make it a reality no matter the size of the task at hand. We’ll move walls and roofs to properly accommodate the new additions or to simply give your home the space it deserves. Nothing says “class” quite like a beautiful stone countertop. At Eleganzza Granite Inc., we provide the two most popular stone options, Natural Slab and Engineered Stone. The former is cut from the earth itself and displays a unique pattern. The latter is made of a mix of mineral and resin which is then formed into slices under high pressure. In addition to providing granite slabs and countertops, we also offer wood products and custom cabinet and shutter contracting services. Consider our team your one-stop-shop for all your kitchen and bathroom remodeling needs! All of our stone options have their share of benefits. Your decision depends solely on your specific needs and requirements. Natural slab granite, for instance, may be more pricey but it works excellently in the kitchen due to its highly-resilient, yet easy-to-clean surface. Engineered stone, on the other hand, may be more adequate for bathroom countertops where the beauty and usefulness of stone may still be beneficial but a higher price point may not be as necessary. Regardless of what you choose, you can rest easy knowing Eleganzza Granite Inc. will provide you with the best service possible.